FAQ - EAT WITH HOP! What is Eat With Hop! about? 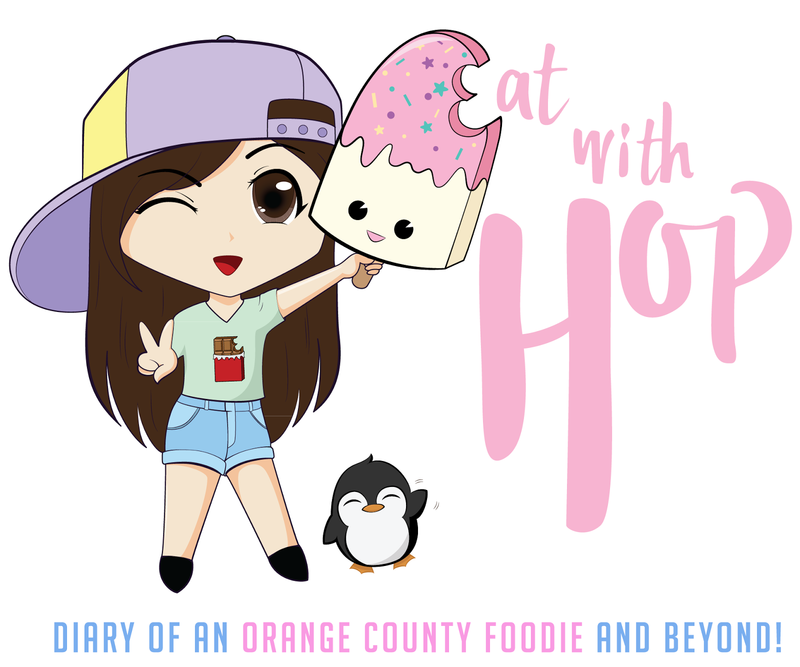 It's about the adventures of an Orange County foodie! I love traveling internationally but find that some of the best places are also all around us! You don't need to go far to enjoy the beauty of the world! And that's what I want to highlight: that there is fun stuff to do and delicious food to eat all around us! That's why I love Orange County and don't wanna take it for granted. There is so much to do here! This blog is also about the life of a foodie featuring product and restaurant reviews in Orange County, Los Angeles, and beyond! Naturally, I get this question the most! I was inspired by other blogs while traveling abroad. So, I thought, let’s just make my own and share my own travels! I wanted to organize all my photos that I take whenever I go out to eat. I’ve always been taking photos ever since the age of Xanga and I decided to finally share them to the world with my own website. Many of my friends also often ask me for suggestions on where to go eat or drink so I thought this blog could be a more organized answer for that. Check out the full confession here. Do you eat out every day for the sake of this blog? I’ve been fortunate enough to be invited to many media tastings and press events to try various restaurants from fine dining to fast food for “free” in exchange for promotion. Find out what that exactly means coming soon on a new blog post. For now, check out all my media events here. What do you use to take your photos and how do you take them? You can tell from the quality of my photos that the nicer and more professional ones are taken with my DSLR Nikon D3200 and Sony Alpha 6000. Honestly, it is super awkward when I go to a restaurant and take a million photos. I'm always thinking to myself, "Maybe one day, these restaurants will be the one asking ME to take their photos," and that's been a dream of mine that has recently come true! But when I go as a customer, it is quite awkward when the restaurant is super popular and there are so many people I want to avoid photobombing my photos. When the restaurant is not crowded, I usually will ask the workers if it is okay for me to go crazy with photo-taking! Who can "Eat With Hop"? If you personally know me then you can for sure join me on my food travels! I love going on adventures with my beloved friends and trying new things! I welcome all of you, my wonderful Taste Buds to join me on my adventures! If you ever see me in person IRL then don't hesitate to say hello and talk foodie to me! I promise I won’t bite (unless you have food). What do you want to gain from this blog? This blog was born out of a hobby of mine. I’ve always loved blogging. With that being said, through this blog, I want to be that virtual friend you reach out to for advice and recommendations. Someone that readers can trust and count on for honest opinions and useful reviews / guides. I noticed that social media nowadays has just become advertisements without much authenticity. I do not want to become a walking advertisement either. So, this blog will continue to stay within its roots: a diary blog documenting the food and travel adventures from a consumer perspective. From that friend you can count on. This hobby blog has given my some great opportunities as well. I am currently working on projects beyond the blog that actually stemmed from the blog itself such as marketing, social media consulting and event organizing. I am so excited and have learned so much! Do you get special discounts for blogging about the restaurants? When I first started, it was just for fun and I didn’t get any sort of discount. It was basically my own space that I owned where I can rant and tell-all. Probably the first month in of blogging I received a thank-you and got my first complimentary meal through the blog! It was from Bowl of Heaven! Ever since then, I have been invited to media events to try various restaurants! Most of the time, it’s just getting “free” food (more on that here) but sometimes I do get paid! How awesome is that? I am fortunate enough that my blog and social media outlets have become slightly more popular and I have gained attention from restaurants and foodies! Because of this, I have had wonderful opportunities to live my childhood dream of being a food critic! I have had the pleasure of being able to review restaurants and food products! I must further emphasize to y'all though that no matter what, I will stay true to my opinions and won't lead you astray. Aside from the media events, I still go to restaurants on my own and pay for my own food like a normal person but take a trillion photos like a tourist. Do you ever just go to restaurants and say you’re a food blogger to get free food? I’ve been asked this quite a lot. I think it’s mostly a half-joke of a question but maybe people really do wonder….? Well anyway, I definitely do not do this. Whenever I go to a restaurant that isn’t part of a collab or media event, I want to be treated as a regular customer so I know how the restaurant operates on a normal basis. I feel like stating that I am a food blogger just for free food is sort of strange or selfish. And there would be an obligation to promoting when really, I just want to eat! Some places do recognize me though and I think that is just pretty cool! Where have you traveled to before? I have had the privilege of traveling to and eating delicious food from Japan, Korea, Vietnam, Canada, Mexico, and the East Coast of U.S. I also recently went traveled to New York for the first time this year in spring of 2016! Do you consider yourself to be a professional food critic? Definitely not. I don't consider my taste palette to be godly enough to be a professional food critic. I just give my 2 cents on what I like and what I don't like and hope that it helps my fellow hungry readers on deciding what they choose for their next meal! Boba / Tea – I am always down for trying new boba places! DESSERT! Probably the bulk of this blog. Especially Ice Cream! I like trying fusion food! Also, Asian food such as Vietnamese, Japanese, Korean and more! I usually do not go to many vegan / vegetarian places or shabu shabu / hot pot restaurants. But am open to the suggestion! How do you know about all these new food places and deals? I also try to be very observant when driving around. Whenever I see a new restaurant on the block or a sign with deals, I’m all-up-in-there and taking notes! I love my website like it’s my baby and pour my heart into it when writing reviews. I want to be that reliable person you would depend on to go eat a worthy meal. Writing quality tips and trustworthy reviews, and taking quality photos takes time and energy, so the sidebar ads help provide me with a bit of gas money. I would appreciate it if you turn off your ad-blocker every time you visit the website, because it would help me out with a few cents here and there! Who created your super kawaii logo? I am so excited to show off my new logo! It was created by my ever so talented friend, Sheena. I wanted a chibi version of Kevin and I and Sheena was able to make that a reality. I’ve known her for almost a decade now and am amazed by her talent to paint, draw, illustrate, and create. She even has her own line of chic purses and bags! Check out her online Etsy Shop. Do you only write good things about restaurants that sponsored you, whether in free food or $$? This is probably my 2nd most asked question. And the answer is nope. Definitely not. I don’t want to lie to people and neither do I want to lie to the restaurant. If it is something super crucial that might hinder the success of the restaurant, I will notify them of my constructive criticism. Otherwise, I will write both the pros AND CONS of the restaurant. I do tend to write the cons in a nicer and more constructive way though. If it’s a restaurant that I just tried on my own and paid for on my own that wasn’t up to par, I tend to rant and be more brutal though, yet try to be constructive as well. I am using Blogger / Blogspot as the platform and bought a template. I know a bit of html from my xanga + myspace + neopets days and manipulated the template to my liking. I also bought my dot com domain from Easy DNS. Could you feature our restaurant / event / product on your blog? For free sponsorship meals, products or events, I try my best to include it on my blog but cannot promise that every invitation will guarantee a feature. Due to a high demand, I prioritize content that is most relatable to my readers and the overall goal of my blog. However, you will most likely (almost 100%) see the content featured on my social media channels (Instagram, Snapchat, Facebook, and Twitter). The only way to guarantee a feature on the blog is through an advertorial campaign sponsorship which will be marked accordingly to abide FTC guidelines. If this is something you’re interested in, feel free to email: GetHungry@EatWithHop.com ! Thank you for attending our media event. How long will it take for you to publish the article? Depending on the urgency of the content, the article can be published as soon as within 1 week, but can take up to 4 weeks. Please do not expect any time sensitive promotions and content that ends within the next few days to be published as the Eat With Hop! team needs appropriate time in advance to do quality write-ups. Your patience is undoubtedly appreciated. After all, these articles are written for free (payment in pizza and tacos doesn’t count). To guarantee a feature, email GetHungry@EatWithHop.com for available sponsorship packages and we can make some magic together! Can I invite Hop to our restaurant / event for media coverage? Of course! I will try my best to make it to any media tasting or event. I would love to RSVP for two people please: my assistant and myself. Someone’s gotta help hold my equipment and help take photos, right? Adjust the lighting and style the food, too. Events that are able to accommodate the entire team will have greater priority. If I cannot make it, my other assistants will be happy to do coverage on my behalf! Meet @eatingwithhop and @eatingwitheatingwithhop, who are always ready to eat (but first, pics). We would like to host a giveaway collaboration with you. How can we set this up? I love giveaways because I love to give back to my readers. I typically prefer to offer gift cards or product for my readers. For the same product, I do one giveaway on the blog that lasts for 1 month (promoted on social media once per week for 4 times total) and one on Instagram that usually lasts for a week. I encourage readers to check out the brand’s social media channels and product. If you have anything in mind, I would love to hear about it! No. Please do not send any emails recommending your awesome 2000 + word articles that will most likely not align with the goals of this blog. If you would like your product to be featured, we can discuss rates via email if it is something that would add value to my readers! My restaurant has a deal / promotion. Can you share with your readers? YES! I love deals! It’s probably one of my most popular sections on my blog. Send whatever deal you have my way and if it’s deemed a worth-it deal, I will share it on my blog and social media channels. I also love collaborating with restaurants to make a special “Eat With Hop” deal. If this is something you are interested in, shoot me an email! Can you write a raving review about our restaurant? Integrity is important to me, and that is what I strive to maintain on this food diary of mine. I cannot guarantee a 5-star review for your restaurant, but only a review that your restaurant rightfully deserves. I tend to be very honest in my reviews but also provide points for the other side because I know everyone has different taste buds. I prioritize my readers over any amount of free food and wouldn’t want to recommend a place they would regret. What are your website and social media stats? Hi www.eatwithhop.com, I’ve come across your blog and love your posts, especially this post: [insert random link I got to pretend I actually read your blog] …. I think you would love [insert info about random product that has nothing to do with food]…..